Fortunately, they are now more than friends they're a pack. They are Virals. Virals is Kathy Reichs young adult novel. I enjoyed it rather a lot and am looking forward to seeing how the story develops in book 2. 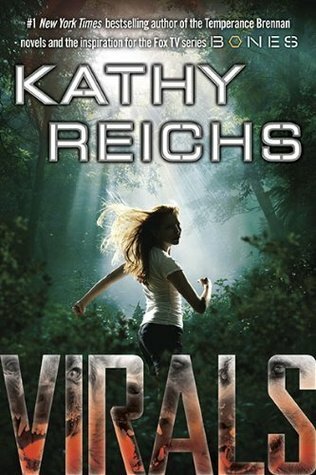 Virals follows the story of Tory Brennan, a teenage girl who lives on a remote island which is inhabited largely by scientists involved in environmental research and their families. She and her friends pretty much have the run of the place and often go off exploring different parts of the island. One day whilst exploring they find an old dog tag which is where the story sparks off from. I'm not familiar with Kathy Reichs as author having read none of her adult books but I did find her latest offering to be entertaining. the book had everything I would expect from a book from Kathy Reichs (this is coming from someone who has only read the blurbs of her adult books but even so) it was fast paced, there was a forensic mystery to be solved with lots of drama and twists and turns added in and most importantly of all a feisty and clever main character. I really liked Tory as a main character as she made it cool to be clever (and now I come to to think of it is rather like a Hermione character, smart, clever, hangs around with boys and has reddy/brown hair) and was quite stubborn in her belief of what was right and wrong. Alongside the issue of the murder to be solved with forensics there was another side to this story which was the one about a super DNA altering virus. I'm not going to say anything much about it apart from to say that it added an interesting dimension to the book and is something that I am sure will be explored in more depth in future books and teased out to be something very interesting. Definitely a must for anyone who has a passing interest in TV programmes like Bones of CSI with the added twist of the main heroes being a bit younger and a slight supernatural twist to make it appeal to a YA audience. A nice change from the constant barrage of dystopian or supernatual romance which is flooding the YA market at present. I've not read anything by Kathy Reichs, though after watching Bones for ages I did consider picking up one of her adult crime novels. Now that she's writing for a YA audience, I think I'll stick with those. Shall be looking eagerly in the library for this one :) Thanks for the great review!